2: Prevent 1 damage to any target. If Rakalite is used, it returns to its owner's hand at end of turn; all enchantments on Rakalite are then discarded. 2: Prevent the next 1 damage that would be dealt to target creature or player this turn. 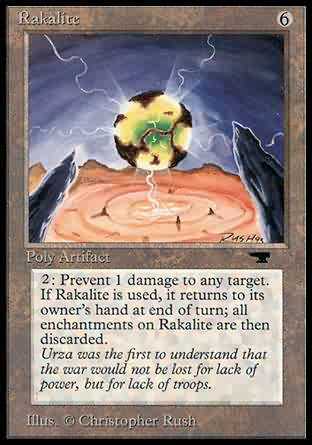 Return Rakalite to its owner's hand at end of turn.